The ITU says 4G supports up to 1GBps download speed. That’s 50x faster than what I get with my 20MBps home broadband on a good day. Whoa dude! 4G LTE. Future proof. Nice! Fast. Cutting Edge. Sadly not available yet, apart from three locations in the US and one in Slough. So basically not anywhere you live or should be living. However, my display already says 4G because I’m with AT&T. But I’m not on LTE. Confused? You should be! 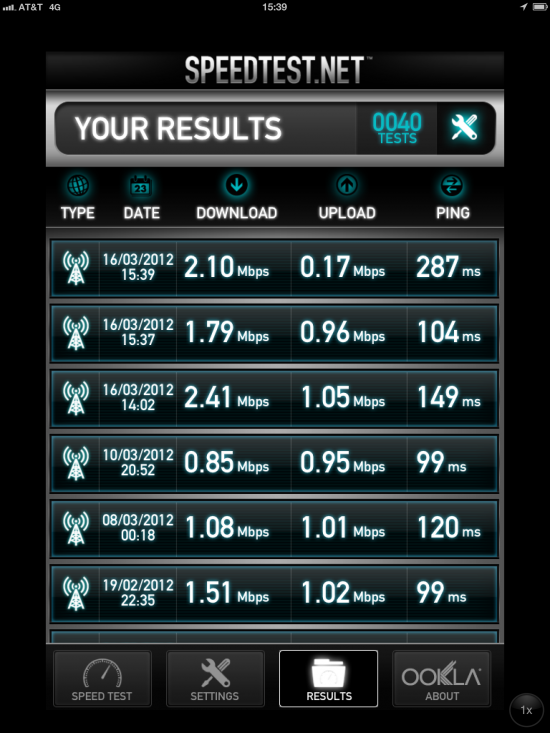 4G LTE is just being tested out, it’s not really here yet. Trials have started, but we can’t really speak of “coverage” right now, neither in the US nor in Europe. By the time we’ll eventually get it, iPad 5 will be out (by then probably branded the really new new iPad). But because it’s hip and cool, providers have already started promoting a technology that’s “almost 4G”, kind of like 3.9G. It’s not LTE, but it’s a very fast version of 3G called HSPA+. iPad 2 does not support this, but iPhone 4S does – and Apple made a deal with AT&T that displays 4G if your device can see it. 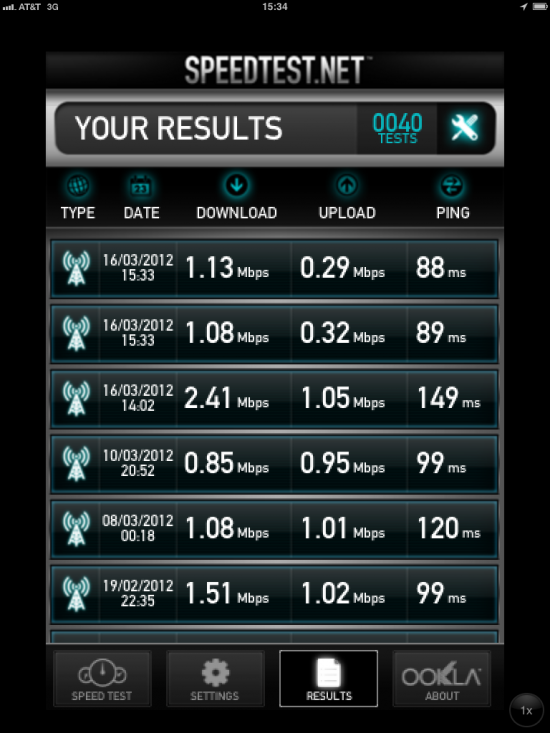 HSPA+ is an extension to the existing 3G network and is a bit like the UMTS/HSDPA addition. The good news is that we HAVE that right now, both in the US and in the UK. So that’s really good. As for LTE, it’s a different frequency band altogether and pretty much the reason we’ve switched off analogue TV not so long ago. That’s where LTE will eventually live in the UK. Rest assured than when it arrives in 3-5 years time, your new iPad (then known as “your really old iPad that needs to go to Cash Exchange”) will be able to connect to it. Pretty inconclusive. Look at the top three tests per screenshot, they’re both done on iPad launch day. 3G transmission speeds greatly fluctuate depending on how congested the network is, so I can’t really see a huge difference between UMTS and HSPD+. But then, I live in Miami Beach which may not be the benchmark for mobile broadband as we know it – metropolitan areas like New York may deliver more conclusive results. I know that my colleague Richard has had UMTS download speeds with Three UK of about 8MBps with his iPad 2 (isn’t that right, Richard?) – so let’s just not get excited about LTE for now and enjoy the 4G label. Many rumours had speculated that perhaps Siri would make an appearance in the new iPad. Well almost: not Siri in person, as in hold down the bottom button and give it a command, but the next best thing. It’s the dictation feature that we’ve come to love. At the bottom left hand side of the keyboard, next to the space bar is a microphone icon. If you tap on it iPad will listen to you and convert what you’re saying into text. Just like Siri, the system has to contact the Apple servers to get the text output so it means you can only use dictation when you’ve got an Internet connection. Works great though! Glad to see this on the iPad. I think it’s the display that wins it for me completely. The super sharp retina display renders fonts just like the iPhone and iPod touch do, reading small print is a pleasure. The higher colour gamut means that pictures and icons look different (i.e. more natural). You can literally see details in your pictures than you never knew was there – it really is a jawdropper. The new camera is such a relief, especially if you use it as a replacement for a scanner. Tethering, i.e. being able to create a WiFi hotspot is a lovely addition, I’ve often wished I could put that huge data package of mine to good use. Even though AT&T do not support this with iPad plans at the time of writing, I’m hoping that Three UK will. So I’ve spent a week with my new toy and I can tell you this much: the display rocks. Seriously. You get used to being able to read everything no matter how small the font is. Pictures I had taken weeks ago shine in a new light as I discover details that I didn’t know was there before – it’s a great enjoyment. HD video is the same: the extra clarity just adds a new dimension to it. But I’ve also found a couple of things that appear to annoy me, which really is a shame. For once, the new iPad is heavier – and that’s not just on paper. I can feel it when I pick it up and use it, especially with the unhealthy “reading while holding it in my left hand hand” approach. You’ll think I’m crazy making a fuzz over the additional weight of a chocolate bar, but I can feel it. The extra strain on your wrist isn’t fun. Not a dealbreaker either, but enough to annoy me. Then there’s the battery. When previously I would have put my depleted iPad to on charge for half an hour, I could take it out again for half a day. Not so with the new iPad. It takes nearly twice as long to charge. Again not massive issue, but it eats into the smooth cool of the iPad 2. I’ve heard reports that charging the new iPad on a well powered USB port or iPhone charger now takes 4x longer than before. That’s mathematically correct: we still only have 10W on the iPad charger, and a maximum of 5W on a USB port. So if the new iPad uses 10W just to operate, and you put 5W in, then you’re still down 5W. iPad 2 on the other hand may have only used 2-3W max, so the extra wattage goes into charging the battery. Software is a biggie though: I have a feeling that the new iPad isn’t as responsive ans slick as iPad 2. I understand there are more pixels to be moved and all, but what made iPad 2 so cool is its slickness. The magic touch if you will. The new iPad feels a bit like an Android tablet, where moving the screen sometimes jitters. Would Steve have approved of this? Certainly not. In addition, many apps are still not (yet) running well on the new iPad, and I don’t mean they haven’t updated their hi-res graphics yet. Some apps just don’t run. I know that’s only a matter of time until developers have sorted this, but my point is we HAVE a well-working version right here today (granted without the Retina Display). Why but up with a Beta Version if you don’t have to? So I’m now thinking: it’s certainly great to have the new iPad, but maybe I’ll keep my old iPad 2 as well and use it depending on the situation. Maybe 2 devices is the answer, especially having one eye on developing apps. None of this really matters, and they’re all minor minor issues that only spring up if you compare both devices. I guess what I’m saying here is that if you have a choice which one to get, and you’re stuck asking yourself which once should you pick up, don’t see the iPad 2 as old technology. It still rocks, so much so that it has advantages over its new brother. I can’t help but wondering that if Steve would be alive… had the new iPad come out thicker and heavier? Or would he have said: “not an option – find a way or you’re fired”!